In a few command we'll end up having a free Google AppEngine serving our minimized website with Polymer setup. We'll be working on Linux (or Mac OS), but almost on any platform you may use Docker images to perform the same steps (even on Windows). Beautiful Material Design thanks to the many Polymer Elements. Works well on mobile where the visual feedbacks are so much more important. Two way data binding, a bit like AngularJS. Makes use of Service Worker. Updated as of 2015-07-13 to describe grid system layout. 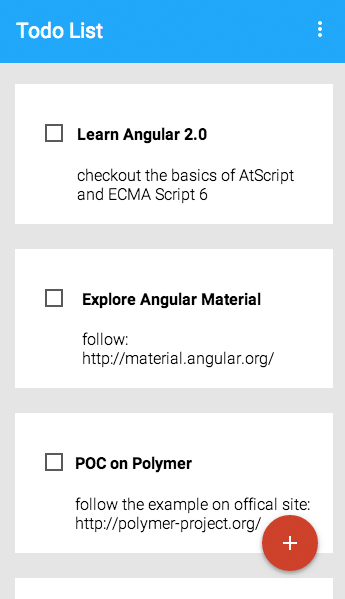 Updated as of 2015-06-25 for Polymer 1.0 and latest gcloud. What if I just want Material style? Material Design Lite - Official version from Google (see the introduction blog post). $ source ~/.profile  # Or restart your terminal. Note: Alternatively use node Docker image via: docker run --rm -it -v $PWD:/code -p 3000:3000 node bash. app/index.html - Main HTML file. app/elements/elements.html - Place to include Polymer imports, always do that before using a component. We are now going to deploy this project for the world to be able to access (you can also limit access). Create a project on Google Developers Console (login using your Google account). Note: Alternatively you could use google/gcloud-sdk Docker image. Just mount $PWD/dist directory, export port 8080, and run gcloud commands in it. You may have noticed there is no grid system (unlike Boostrap or Foundation). This is because it encourages you to use CSS3 Flexbox grid system (see flexible boxes reference on MDN for details) via their iron-flex-layout. The main flexboxes features are already pretty well supported by browsers (but not all). You may also want to use CCA or Cordova to build a mobile application from your web pages. Copyright © 1998‒2018 Werner BEROUX. Tous droits réservés.